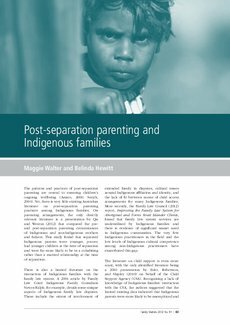 This paper explores the shape and practice of Indigenous family relationships as they relate to post-separation parenting. While we already know that Indigenous families are younger, poorer and more likely to be sole parent families than non-Indigenous families we currently know very little about how these families practice the complexities of post-parental separation parenting. Data from the Longitudinal Study of Indigenous Children, Wave 2, allows for the mapping of these dimensions of family life. In this study we investigate, for those children whose other parent lives in another household, the pattern of study children’s interaction with non-resident parents and ongoing financial support from that parent, primarily as reflected by the payment or receipt of child support.